Grammy-nominated rapper Nipsey Hussle, who was gunned down on Sunday outside his clothing store in South Los Angeles, was scheduled to meet with the city’s police chief and the president of police commission Monday afternoon to discuss ways he could help prevent children from getting involved in gangs. “We’re talking about programs to help underserved kids, to keep kids out of gangs. And this was his idea. We’ve been working on this meeting for three months. How I wish it would have been on Saturday,” Steve Soboroff, president of the Los Angeles Police Commission, told ABC News on Monday morning. The rapper has spoken publicly about his involvement with the Rollin’ 60s gang, one of the biggest Crip gangs in Los Angeles. Hussle, who was lauded as an entrepreneur in his home city and “inspiration to many,” was standing in a parking lot outside his clothing store in L.A.’s Hyde Park area around 3:20 p.m. Sunday when a gunman approached and shot him multiple times and left two other people wounded, police said. He was taken to a local hospital where he was pronounced dead. The coroner determined the rapper died from gunshot wounds to the head and torso, ruling the manner of death a homicide. Police continued working Monday to identify the killer and anyone else who may have been involved in the shooting. Soboroff said the meeting Nipsey Hussle had requested with him and Los Angeles Police Chief Michel Moore would go on as scheduled with representatives of Roc Nation, the entertainment company founded by rapper Jay-Z, set to attend. Moore tweeted early Monday that the slaying of the 33-year-old rapper, who was born Ermias Asghedom and raised in the neighborhood where he was fatally shot, came during a “troubling surge in violence” in Los Angeles. Moore tweeted that since last Sunday, 26 victims have been shot and there were an additional 10 homicides. 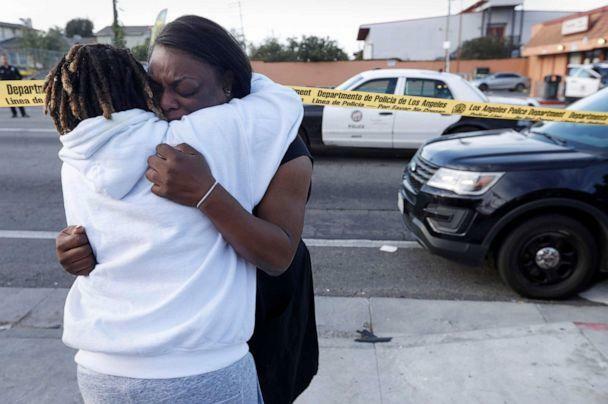 Tonight’s homicide in South LA represents the latest loss in a troubling surge in violence. Since last Sunday 26 victims have been shot & 10 homicides—that’s 36 families left picking up the pieces. We will work aggressively with our community to quell this senseless loss of life. Some of hip-hop’s biggest and brightest stars took to social media on Sunday to mourn the entertainer’s death. Hundreds of fans congregated in front of Nipsey Hussle’s store, The Marathon, where he was shot. “I was a childhood friend. I’ve been knowing him all my life. He was like family to me,” Marquesha Lawson, breaking down in tears, told ABC Los Angeles station KABC. The rapper’s debut studio album, “Victory Lap,” received a 2019 Grammy nomination for Best Rap Album, but hip-hop sensation Cardi B ultimately took home the win.